Keeps your FireAde extinguisher within easy reach. This light-weight aluminum extinguisher holder can be mounted to any wall or inside your vehicle. No straps or clips to unfasten means easy and quick access in an emergency. Only $4.50 each when ordered along with FireAde 2000 Extinguishers. 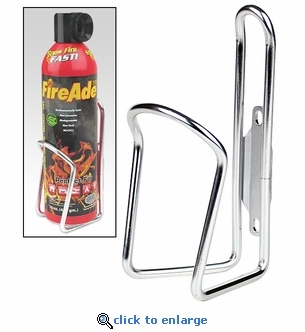 When you add a FireAde extinguisher to your shopping cart you will have the opportunity to add extinguisher brackets at the reduced cost from your shopping cart.